Pulse Solutions documents a pivotal event in history at www.langvei.com. 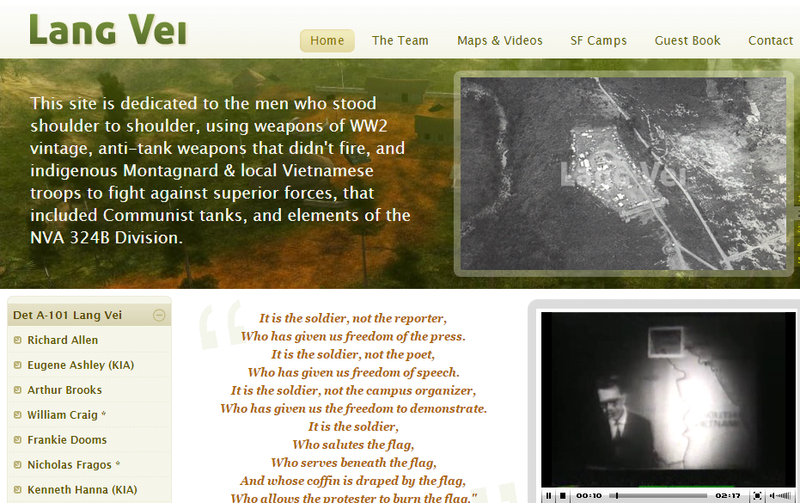 This site narrates a first hand story of soldiers who fought the battle of Lang Vei, a battle of the Vietnam War fought on the night of 6 February 1968, between elements of the People’s Army of Vietnam (PAVN) and the United States-led Detachment A-101, 5th Special Forces Group. Two dozen US Army Green Berets and several hundred Vietnamese repulsed an attack by superior North Vietnamese units operating with heavy armored support. Under the control of the 5th Special Forces Group, the Lang Vei Camp had been conceived as a base from which to administer the local Civilian Irregular Defense Group (CIDG) program to train and equip locally recruited Vietnamese. These irregulars would operate in the remote, sparsely populated, contested areas where they could be more effectively used than Vietnamese Army and other Free World forces. Lang Vei was key terrain. It was strategically located along Highway 9, a major egress of the Ho Chi Minh trail and on the line of communication to Khe Sanh. It was an observation post along the Laotian border preventing unhindered infiltration of NVA units from Laos Lang Vei’s garrison provided flank security for Khe Sanh and could maneuver against an NVA attack on the Marine base. But the defenders of Lang Vei destroyed over half of the NVA armor force. NVA troop losses were much larger than expected, preventing them from concentrating an attack against the U.S. Marine combat base at Khe Sanh. The attrition of NVA units at Lang Vei caused a strategic shift in NVA troop deployments. Heavily attritted NVA units, which were engaged in combat at Lang Vei and around Khe Sanh, were later committed to Hue with little effect. The defenders of Lang Vei were successful in interdicting and attritting the attacking NVA ground forces because of the camp’s combat power, i.e. maneuver, firepower, protection, and leadership. Pulse Solutions brings to the world soldier’s memoirs of their time spent in war. It is a step-by-step reconstruction of what happened at the battle ground and is narrated by soldiers who actually fought the war. The website also features team members, maps and videos, SF camps and a guest book.